Anyone knows what is the exact time of 0-60 miles (0-100 km/h) for the EVO 8 (no mods)? Cause the 6.1 sec does not convince me.. This is the time for the standard EVO 8 (265 ps?) Are you sure ? Cause it weights 1470 kilos...My previous car (subaru imprezza gt) had 218 ps with 1250 kilos of weight and had 5.9 sec. So i find 4.8 a little bit.. extravagant!! No, you are right Antioch. But i still think that 5.0 sec for 0-100 km/h is an utopia..
Last edited by blonde; May 22, 2004 at 10:34 AM. i always thought it was 4.8 s but today i went to the mitsu dealership to check out the 04 evo and they told me that it was 4.5???? I asked if he 04 models are faster ( knowing that nothing in the engine has changed ) and they said no and that the 03 models are 4.5 too????????????????? is that a load of bs or what? 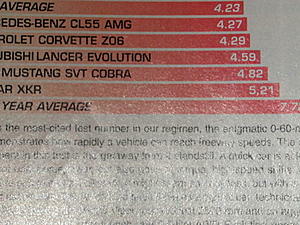 there was actually an article in Motor Trend magazine that clocked the evo doind 0-60mph in 4.59 sec. It was in a 10-car test with Mosler Photon, Viper, 575M, Murcielago and some other HIGH end cars. I guess with the right driver, anything's possible. BTW in the same test, evo ran a 13.08 @ 105.12 in the 1320. I have a dead stock Evo and without revving over 3000 at launch clocked a 5.22 UPHILL. 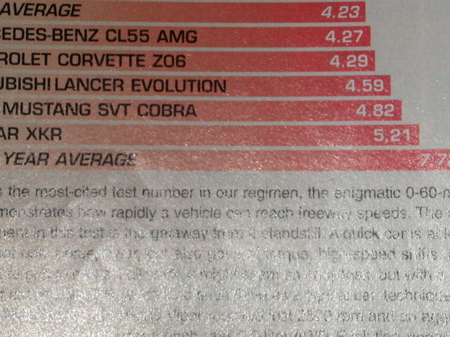 I have no doubt with an aggresive launch a stock Evo can do 4.6.